Curious about life on a pirate ship? Climb aboard this account of adventure on the high seas as told by a feisty nine-year-old carpenter's apprentice, circa 1716. Curious about life on a pirate ship? 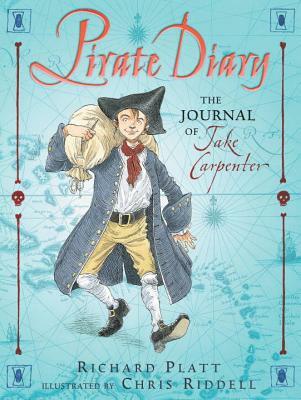 Climb aboard this account of adventure on the high seas as told by a feisty nine-year-old carpenter's apprentice, circa 1716. Historically accurate illustrations of ship and crew, a map of Jake's travels, and a detailed glossary and index vividly reveal the fascinating — and harsh — life of a pirate in the eighteenth century. Ships ahoy! Richard Platt has written more than thirty books, including many bestsellers, and is among the most prolific and successful nonfiction authors working today. His books include STEPHEN BIESTY'S CROSS-SECTIONS: CASTLE; STEPHEN BIESTY'S INCREDIBLE CROSS-SECTIONS; STEPHEN BIESTY'S INCREDIBLE EXPLOSIONS (which tied for the 1996 Cuffie Award for nonfiction with THE GREEK NEWS and THE ROMAN NEWS); STEPHEN BIESTY'S INCREDIBLE BODY; STEPHEN BIESTY'S INCREDIBLE EVERYTHING; IN THE BEGINNING; THE NEARLY COMPLETE HISTORY OF ALMOST EVERYTHING; DISASTER! CATASTROPHES THAT SHOOK THE WORLD; and the Eyewitness titles, FILM and SPY, among many others. Chris Riddell’s glorious illustrations fill the pages of many wonderful books for children, including Richard Platt’s CASTLE DIARY, and Hans Christian Andersen’s THE SWAN'S STORIES, translated by Brian Alderson. PUBLISHERS WEEKLY called his illustrations for CASTLE DIARY "humorously dour" and "inspired."